31 Responses to "November 2010 filming times (GFX)"
I WANNA GO! i think i would DIE! Its definitely worth a look Ben! Helen do it! Would be so awesome to catch up with you again! I’m doing the party and thats it – race you under the table Glen! I bet you do the classes Rach, you won’t be able to stop yourself! would love to go to a BC filming… if I had known about this 4 weeks ago I could have booked a trip to Auckland instead of Wellington for my 40th! yeah – we are ok… our house is still standing in one piece… our suburb was not hit that bad – we have power, phone, water… quite lucky really! Cool – so how do you go about securing a place in RPM? As in who to contact or whether there’s a form to fill out etc? then how about securing a place in other progs filming (other than RPM), who is the person to contact for booking/to get the pass? My name is Chen and I’m from Malaysia. I will be in New Zealand during the GFX period and would love to join the event. May I know is the GFX open to all or is it only for fitness instructors? Would non-instructors be able to attend the workshops? I am not a fitness instructor. Yes the GFX is open to everyone – effectively because it’s held at the Les Mills gym anyone in the gym at the time can go. Probably your best bet is to contact Les Mills NZ for a pass (email Gemma Knight gemma.knight@lesmills.co.nz) otherwise you could just come to the gym on the day and buy a day pass which would give you access to everything anyway. Hope this helps! I’m coming from the US for the November filming! Can you give me any other great advice? I just found you on FB and sent a friend request. Great to meet you! Just get to the gym early, and carry a very small bag you can fit under a bench or you’ll have to put it in a locker (and risk losing your spot… seriously!). See you there! Kia Ora Glen, do u know if LM has released the January/Feb dates yet? I’ll be coming home around then and wanted to try make it to a filming. Also.. who do u contact in NZ to do module training? Been really hard to find that info aye. Will I don’t have them yet but aim for the end of Jan. To do the module training you need a sponsor gym and they need to sort it out – you can’t actually rock up and just do it unfortunately. Do you have a gym that you’re training at? will ‘CORE’ be release din Australia? My name is Emily and I’m a Body Combat instructor newbie in the Netherlands. Your blog is awesome!! Thanks for keeping us all up to date! 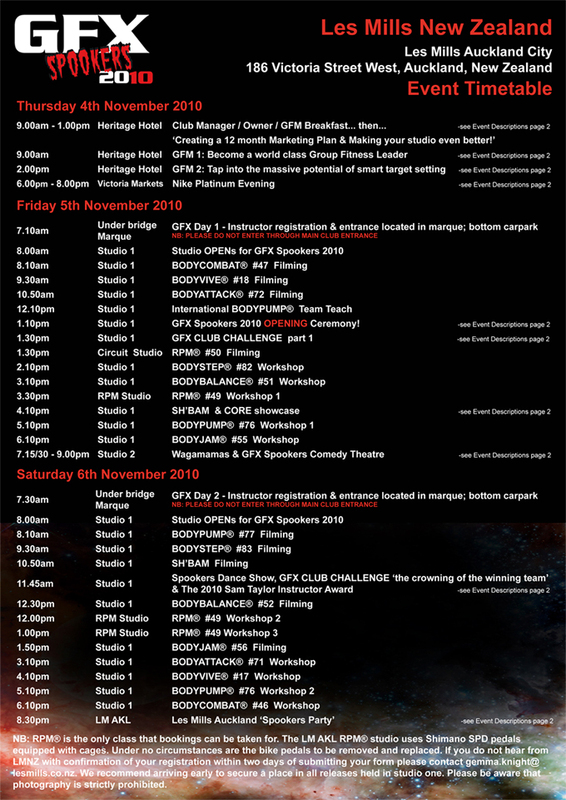 I hope to be in Auckland on 5 November during my first trip to New Zealand and I would very much love to join Body Combat 47 filming!!! Which accommodation do you recommend to stay so that’s short walk to the Les Mills gym? And Gemma is the one to contact for the booking, right? Thanks for your reply! Hope to meet you in Auckland! Hi Emily! Yep contact Gemma. A lot of the filming crew stay at Oaks Apartments on Hobson St, they give Les Mills people a better rate so make sure you tell them you’rew going to the GFX. Otherwise Heritage Hotel Auckland is really close too. See ya there! Thanks Glen! I am booked at Auckland Oaks. Looks awesome. I emailed Gemma but never heard back so I emailed Carla now too. I don’t want to be turned away. Are there going to be any upskillings or education sessions offered at the GFX?